This is a pretty straight forward and easy to prepare recipe using pork filet (pork tenderloin). A classic French dish in preparation and flavor the Chef Scotty way. I hope you enjoy it! Deglazing the pan with port and cream. Trim clean and smooth your pork tenderloin removing excess fat and silver skin. If you are unsure how to do this just ask your butcher. Cut the pork tenderloin into 2-inch medallions. Season the medallions with Turkey Punch Seasoning (despite the name, my Turkey Punch Seasoning is incredible with pork!) or use your own salt and black pepper blend. Roll the seasoned medallion in the flour, coating all over. Tap the medallion to remove any excess flour and set aside. In a heavy bottom skillet, begin to melt 2 tablespoons of butter. When the butter stops foaming add the sliced mushrooms, a pinch of salt and pepper (or Cook’s Line Seasoning) and begin to cook. The mushrooms will release a lot of water so don’t be freaked out. Just give them some time to cook, the water to evaporate, and the sliced mushrooms to turn a nice golden brown. Remove the mushrooms to a clean bowl. In a small saucepan begin heating the heavy cream. Bring to a light boil then turn the heat down to an easy simmer. Careful not to scorch the bottom of the pan! Reduce the cream by 1/4. Add the remaining 2 tablespoons of butter plus a little grapeseed oil to increase the “pan life” of the butter and begin to heat. After the butter has melted, add the pork medallions to the pan, standing up in the pan. Cook on the top and bottom of the medallions about 3 minutes each side is golden brown. Flip them over on their sides and brown 1 minute on each side. It's important not to overcrowd the pan and bring down the temp of the pan down… do this in batches if you need to. Brown all of the medallions and remove to a warm dish. Keep covered. Pour out any excess butter. Place the pan back on the heat. Pour in the port wine and deglaze the pan. Scrape up any cooked bits on the bottom of the pan. Add half of the reduced heavy cream and continue scraping and flavoring the sauce. Add the 1 cup of chicken stock and the remaining heavy cream. Make sure the bottom of the pan is nice and clean. At this poi]\\ strain the sauce to remove any brown bits that did not incorporate into the sauce into a clean saucepan. If not, that is okay too. 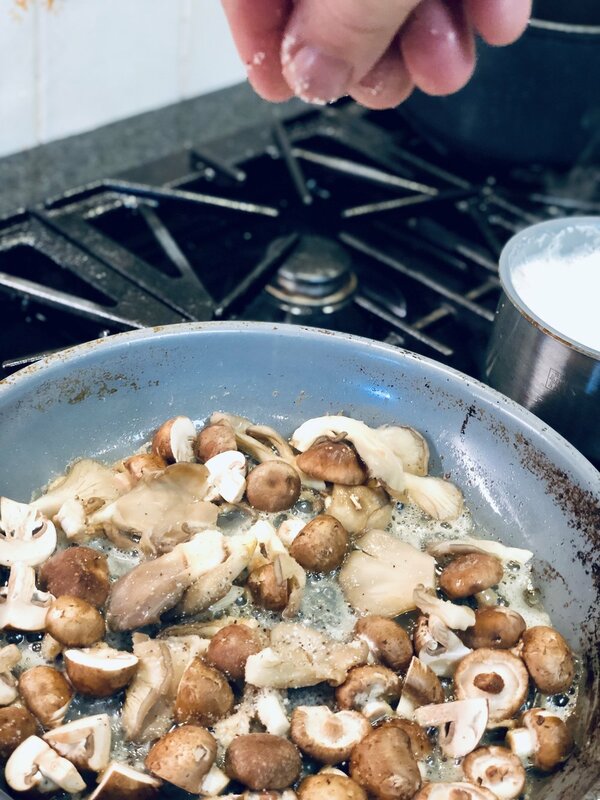 Add the mushrooms to your sauce. Cook until the sauce is nice and flavorful and thickened. When the sauce can coat the back of a spoon, and you can run a line through it with your finger without the sauce falling back into the line (Nappe), then the sauce is ready. Taste for any additional seasoning and add salt and pepper (or Cook’s Line Seasoning). Plate your medallions along with any vegetable or potatoes. 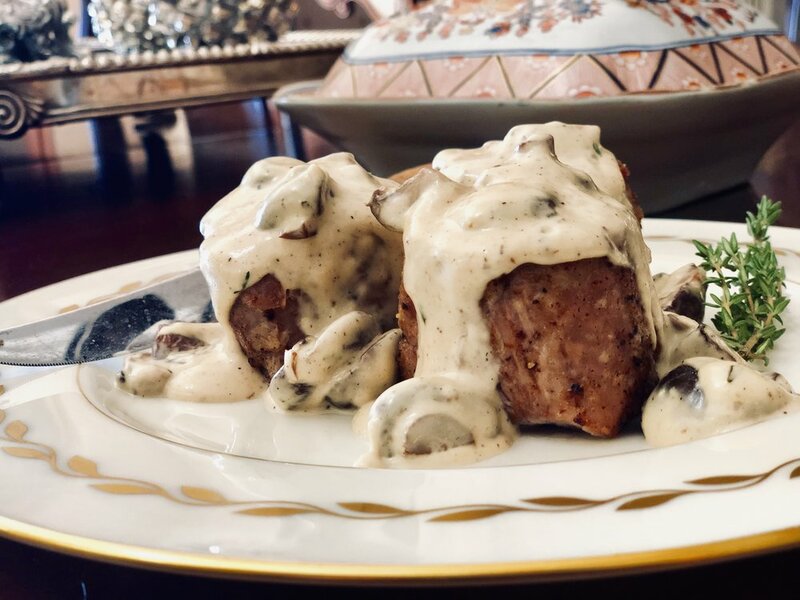 Gently sauce each medallion with your Mushroom Port Wine sauce and serve right away. Enjoy!